It's fast, powerful and lightweight - but is it for you? The Dell Inspiron 13 7000 is one of the most popular 2-in-1 laptops around and a great value hybrid model from the leading brand in work computers. It performs well as a work laptop thanks to a lightweight and flexible design, combined with the sort of powerful quad-core processor you’d expect to find on a far pricier model. 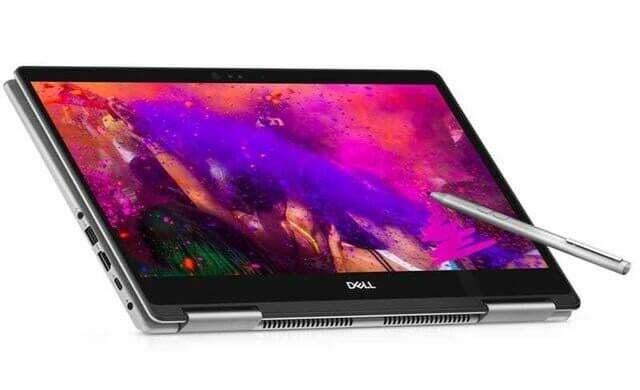 Portable and high quality convertible laptops for around the £700 price mark are few and far between, but the Dell Inspiron 13 7000 is a stellar option, especially for small business owners. That’s why we made it one of our best budget laptops for under £700. A nifty little eighth-generation Intel Core i5 processor with a quad-core CPU (central processing unit) makes the Dell Inspiron 13 ultra fast and a joy to use. It can tackle an document work, web browsing or even photo editing with finesse – and boots up in just eight seconds. The keyboard is well-made and backlit (extra useful for an late night work) and the touchpad is nice and responsive. There are even some nice touches like facial recognition, giving you extra security by letting you log into your laptop using just your face. For all its top-notch features, the battery on the Dell Inspiron 13 could be even better. That said, six hours is nothing to be sniffed at and for many small business owners it’ll be more than enough. Longer battery lives are out there, but they tend to cost quite a bit more. The screen on this Inspiron laptop is really impressive for such a good value device. Images are clear, text is easy to read and even films look great. Most 2-in-1 webcams are nothing fancy, but this one’s even good enough for business calls. And the touch screen is extra useful for those of us who get used to this flexibility from our smartphones. The speakers are perfectly fine and decent enough for business calls. They could have even more detail, but more basic audio is common in hybrid laptops. If you’re into your booming bass, you can always connect headphones or your own hi-fi system. If you’re keen to bag yourself a 2-in-1 laptop that’s as portable as it is powerful for around the £700 price mark, you may not be too impressed by your options. But we’ve tracked down a top-rated little device with premium specs like its lightning fast quad-core processor, ultra smooth touchpad and professional quality webcam. Dell is one of our five most reliable laptop brands and the Dell Inspiron 13 performs well in nearly every area. It’s a really well-crafted device and was made to take the pain out of the work day. Want to make it yours? Below are the best Dell Inspiron 13 deals from some of the UK’s most trusted laptop providers now.